Help spread the word about Trojan Thursday. Is there anyone you know who loves UNI and wants weekly updates on our UNI athletic teams? Please pass the link on to them. If you would like to receive Trojan Thursday each week please go to https://unitrojanthursday.wordpress.com and type in your email address. You will receive a notice each week when Trojan Thursday is posted. Twitter – If you have a Twitter account and would like updates on how our UNI athletic teams are doing, you can follow us @UNI_Athletics. It is another way to highlight our athletic teams and star performances by our athletes. Boys and Girls Cross Country– This last Saturday the Cross Country team competed at the Mt. Sac Cross Country Invitational. Our top finishers on the girls side were Junior Janine Bryant followed by Freshman Sara Sussman, Senior Stacey Yu, Senior Andrea White, Freshman Abby Sanders and Junior Anna Pan. On the Boys side our top finishers were Senior Eric Kawana, followed by Senior Mackhai Nguyen and Freshman Abhishek Nisha Anish. One notable finish came in the Division 1 Freshman race with our Freshman team finishing 2nd. The Freshman team was led by Cyrus Bower followed by Elias Cannesson, Kohl Hertz, Sam Kammerman and Max Solomon. Our next meet is league finals at Irvine Park. Go Trojan Running!!! Football – Our boys suffered their first loss of the season to league power CDM last Friday night. While our boys did lose the game they did earn a lot of respect from CDM and the area football coaches. Despite the loss our Trojans were voted into the top 10 of CIF for the first time this season by the division coaches. CDM opened the scoring late in the first quarter and we answered a few minutes later with a Neil Boudreau touchdown run to tie the score at 7. Matt Abellandea added a 2 yard TD run in the second quarter and the score at halftime found CDM leading 21-14. Alex Pourdanesh caught an 18 yard touchdown pass in the final minute of the third quarter to tie the game at 21. CDM used a long 30 yard pass to find the end zone in the fourth to take the lead. Two late touchdowns by CDM pushed the score to 42-21. The final score was not an indication on how close this game really was. Our boys proved we can play with anyone and they are excited to take on Irvine this Friday night at Irvine H.S. Game time is 7:00. Come out and support our boys and they look to take a step closer to claiming the Fence-post as Irvine City Champs. Girls Golf – The UNI Girl’s golf team finished the season in 3rd place. We qualified for the first round of CIF, the Team Divisional. We play this coming Monday at Lakewood Country Club. At League Finals for individual CIF qualification, we place 3 golfers in the top 7: Ellen Takada, senior came in 3rd, Samantha Cabunag, sophomore, came in 6th, and Nodoka Honda, freshman, finished 7th. These three golfers played this past Monday and both Ellen and Sam qualified for the CIF SS championships next week. Nodoka missed qualifying by one stroke. Great job this year girls and good luck in CIF. Girls Volleyball – GOW TODAY – BE THERE – Our girl will play Irvine this afternoon at 5:15 in their GOW. Come on out to the gym and help cheer on our girls. We are looking for a noisy crowd to cheer on our girls in their last home game of the season. Good luck today girls. Girls Tennis – The girls tennis team won their last two league matches defeating Irvine 17 to 1 and Woodbridge 13 to 5 to finish the regular season with a record of 12 and 5 overall and 7 and 3 in the Pacific Coast League. On Wednesday the girls played the first day of the Pacific Coast League individual tournament. In doubles action, Michelle Maddox and Ashlyn Wang won their quarter-final match to make it to the semi-final as did Sasha Iraniha and Tiffany Markus. In singles, Judy Kam won her quarter-final match to make it to Thursday’s semi-final match. CIF team playoffs will begin next Wednesday. Good Luck today at individuals and next week in CIF Tennis. Boys Water Polo – Our boys won their first league game in over 2 years against Northwood 13-12 in a thrilling overtime finish last Thursday at their game of the week. What a great atmosphere. We want to thank all the UNI students, teachers, admin and parents who came out to cheer and support!!! All players contributed greatly…..on Tuesday 10/27 the poloists lost at Corona del Mar with a score of 7-22. This Thursday 10/29 we host Irvine @ our UNI pool, varsity at 4pm. There will be a brief ceremony prior to the game honoring our seniors. Our last regular season game of the year will be at Woodbridge H.S. on Tuesday 11/3. Good Luck to our polo players in their last few games. Next week our football team will battle Woodbridge for the Fencepost trophy as the City of Irvine Champs and for a spot in the CIF playoffs. We are expecting a sell out for the game. With this being such a big game we would like to do a giveaway for our students in the Trojan Army to get them even more excited and engaged for the big game. We have a couple of ideas in mind. The one small obstacle is money. We have received a donation from Daily Grill in Irvine to help out with this giveaway. We are also asking for help from our UNI Parents to offset the coast of making this game as memorable as possible. If your family or company would like to make a small donation please contact Kevin McCaffrey at KevinMccaffrey@iusd.org. Thank you for your support and we hope you are making plans to attend this BIG game next Friday night here at UNI. Welcome to Trojan Thursday – Help spread the word about Trojan Thursday. Is there anyone you know who loves UNI and wants weekly updates on our UNI athletic teams. Please pass the link on to them. If you would like to receive Trojan Thursday each week please go to https://unitrojanthursday.wordpress.com and type in your email address. You will receive a notice each week when Trojan Thursday is posted. Twitter is taking off – We launched our @UNI_Athletics twitter site last year and it took some time for it to catch on. Over the past 6 weeks we have had 150 new followers. If you have a Twitter account and would like updates on how our UNI athletic teams are doing, you can follow us @UNI_Athletics. It is another way to highlight our athletic teams and star performances by our athletes. 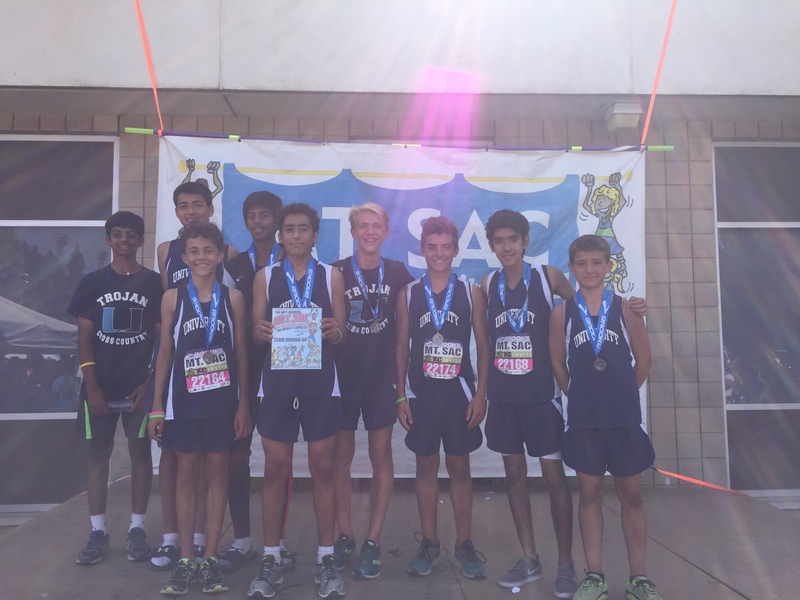 Boys and Girls Cross Country– Cross Country competed in the Orange County Cross Country Championships this last Saturday at Irvine Park. On our ladies side, we had some good performances from junior Janine Bryant, Freshman Sara Sussman and Senior Stacey Yu. For the boys our standout performances were from senior Eric Kawana, Senior Mackhai Nguyen and Freshman Abhishek Nisha Anish. This Saturday we will be competing at the World’s Largest Cross Country race at Mt Sac. Go Trojan Running! Football – WHAT A GAME! – Our boys once again proved that the game isn’t over until the clock hits 00:00. Northwood drove the ball down the field and kicked a field goal with 34 seconds left in the game to make the score 17-16. It looked as though Northwood had won the game. Our boys once again used their refuse to lose attitude and moved the ball 70 yards in two plays to set up a Nick Loveland game winning field goal. The final drive started with a 15 yard pass completion to Matt Abellaneda. The next play quarterback Neil Boudreau found Michael Jung on a post pattern and Michael turned up field for a 55 yard gain to set up the winning kick. On Defense Anthony Medina made an amazing interception off of his foot and then returned the interception for a Trojan touchdown. Our boys look to keep this momentum going tomorrow night as they battle league power house CDM. The game has been picked at the Cox 3 Game of the Week. We need everyone there to cheer on our boys. This is a reminder that the game is a Pink Out. If you are attending please wear Pink. Girls Golf – Yesterday our golfers played in day one of the PCL finals. All six of our girls made the cut by individually finishing in the top 18. All of our girls will be playing today in the league finals. Good luck to the following girls today. Girls Volleyball –Our girls take on Northwood today here at UNI at 4;15. Good Luck Volleyball! Girls Tennis – The Uni girls tennis team had a tough stretch this past week losing matches to Northwood and CDM. The loss to Northwood last Thursday marked the first time in 11 years that the girls have lost to the Timberwolves. On Tuesday the girls dropped another match to CDM. Anja Seng, Michelle Maddox and Ashlyn Wang played some outstanding tennis in the loss to the Sea Queens. The Trojan girls are now 5 and 3 in league and 10 and 4 overall. Our next match is today against Irvine at home. Boys Water Polo – GOW – TODAY 4:15 – Water polo lost a close match last Thursday against Woodbridge 15-13, Daniel Campanaro lead all goal scorers with 5 goals. 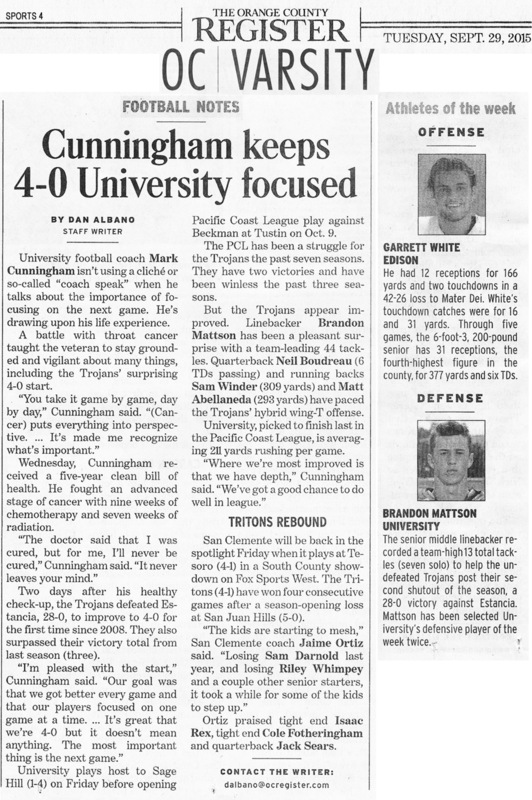 The Trojans fell this past Tuesday to Beckman 18-12, although Campanaro lead again with 6 goals, it wasn’t enough for the Trojans who are now 0-6 in Pacific Coast League with 4 games remaining. This afternoon we host Northwood @ UNI pool for the game of the week. Come on out to the pool this afternoon to support our Boys! Girls Basketball – Calling all former varsity basketball players. We are having an alumni girls basketball game on Nov 27th at 6pm and would like to get as many alumni as possible. I thought maybe some family members would see email and let former players know. Pink Trojan Army Shirts – Our Pink out game tomorrow night v CDM. As of yesterday we sold out of our original order of 400 shirts. Dating back to last year we have sold over 1000 pink shirts. We placed a last minute rush order for and additional 125 shirts and those will arrive tomorrow. The shirts are $8 and are available in the athletic office. If you didn’t get a chance to buy a pink shirt yet come to the athletic office at snack or lunch to pick one up. Im willing to bet that this order will also sell out by the end of lunch. Parents – Wear Pink – If you are attending the football game tomorrow night please help us Pink Out the stadium. We are asking that all UNI supporters attending the game tomorrow to wear Pink to the game. Cox 3 Game of the Week – our game tomorrow night has been selected as the Cox 3 Game of the Week. Come on out to the stadium to help cheer our boys on. Boys Water Polo v Northwood – 4:00 –This is their GOW. Come pack the pool for our boys. We launched our @UNI_Athletics twitter site last year and it took some time for it to catch on. Over the past 6 weeks we have had 150 new followers. If you have a Twitter account and would like updates on how our UNI athletic teams are doing, you can follow us @UNI_Athletics. It is another way to highlight our athletic teams and star performances by our athletes. Boys and Girls Cross Country– Our cross country runners have been practicing all week in preparation for this Saturdays OC Championships. Good Luck runners. 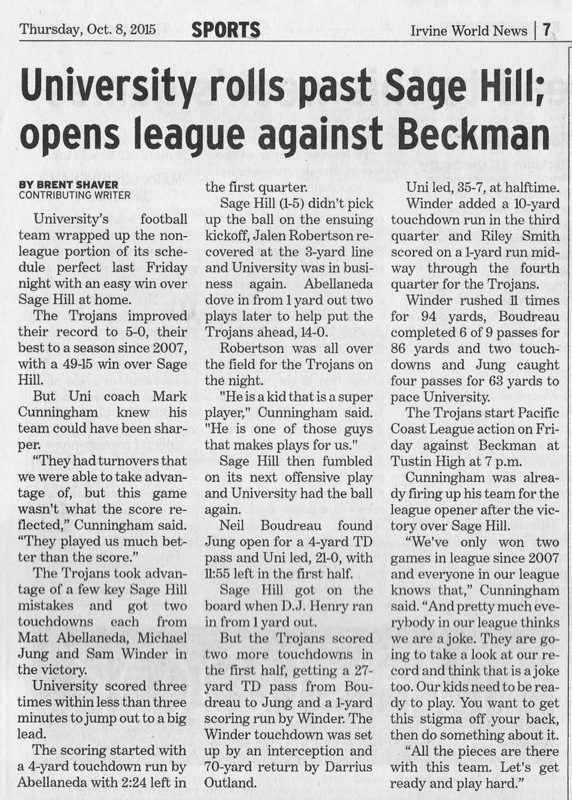 Football – Our boys sent a message to the rest of the league last Friday night showing that our undefeated record was no fluke with a convincing 35-10 victory over Beckman. Neil Boudreau started the scoring with a 6 yard TD run in the first quarter. Beckman answered with their own score late in the first to tie the score at 7. Matt Abellaneda punched in a 1 yard TD run and our boys took a 14-10 lead into halftime. Matt added two more 1 yard TD runs in the second half and Alex Pourdanesh added a 60 yard interception return for a touchdown to push the score to 35-10. Our defense threw a shutout in the second half. With the win our boys move to 6-0 and 1-0 in league play. Tomorrow night we travel to Irvine Stadium to take on Northwood who is also 1-0 in league. This should be a great battle so come on our and support our boys. Girls Golf – Last Thursday we beat Corona del Mar 187-216. Ellen Takada and Samantha Cabunag had the low rounds at 35. This past Tuesday, we had our final home match beating Irvine 200-229. Ellen Takada shot a 4-under par 32. Our final PCL match of the season is this afternoon v Woodbridge. Good Luck golfers! Girls Volleyball – Our girls will battle crosstown rival Woodbridge this afternoon at 5:15. Come on our to the gym and support our girls. Girls Tennis – The girls tennis team moved to 5 wins and 1 loss in league play with a 14 to 4 victory over Beckman on Tuesday at their GOW. Michelle Maddox and Ashlyn Wang led the team winning all three of their sets at first doubles. Adrianna Pinto also got her first varsity win playing 2nd singles. With the win the Uni girl improved to 10 wins and 2 losses on the season. The girls play a big match against Northwood on the Uni courts today at 3pm. Good Luck girls! Boys Water Polo – Boys water polo had a rough time last week oct. 8th losing to CDM at home 24-7. On Tues Oct. 13th the UNI boys were defeated at Irvine H.S. 16-9. 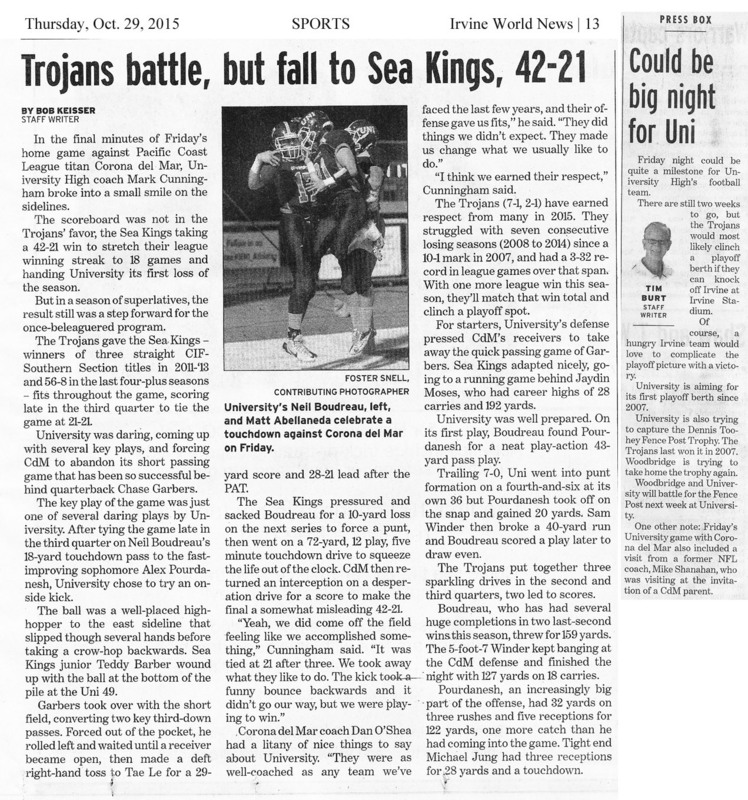 The Trojans hope to turnaround their recent slump with series of upcoming home games at the UNI pool starting with Oct. 15th vs. Woodbridge, Oct. 20th vs. Beckman and Oct. 22nd vs. Northwood which is game of the week. Come on out to the pool and support our Polo boys! Girls Basketball – Calling all former varsity basketball players. We are having an alumni girls basketball game on Nov 27th at 6pm and would like to get as many alumni as possible. I thought maybe some family members would see email and let former players know. Student section of the week – TROJAN ARMY STRONG – Our Trojan Army student section was named student section of the week by OC Sidelines two weeks ago. Below is the article that was done on our student section. We hope the Army will be out in full force tomorrow night for the big game v Northwood. Pink Trojan Army Shirts – Our Pink out game is set for October 23rd v CDM. We are currently selling our Pink Trojan Army shirts in the athletic office. The shirts are $8. Make sure to get your shirt before we sell out. Last year we sold out of 400 shirts in one lunch period. They will sell out next week so it would be wise to get yours ASAP! Boys and Girls Cross Country– UNI Cross Country had a tough league meet yesterday at Mason Park against all of the teams in the league. Overall, all of the athletes met or surpassed their personal best for the season or for the year. The girls were led by Janine Bryant, Sara Sussman and Stacey Yu while the boys were led by Eric Kawana, Eli Tita and Mackhai Nguyen. Our next meet is Saturday October 17th at Irvine Park for the Orange County Cross Country Championships. Go Trojan Running! Football – Our boys posted an impressive 49-14 victory over Sage Hill last Friday Night in front of a packed stadium for Homecoming. Matt Abellaneda and Sam Winder both had two scoring Touchdowns. Michael Jung added two Touchdown receptions from Neil Boudreau. Riley Smith capped the scoring late in the 4th with a 1 yard Touchdown run. The UNI defense put up another strong performance only allowing two Sage Hill touchdowns. Our boys will travel to Tustin HS to play Beckman in a huge game tomorrow night. This will be the first league game for both teams. 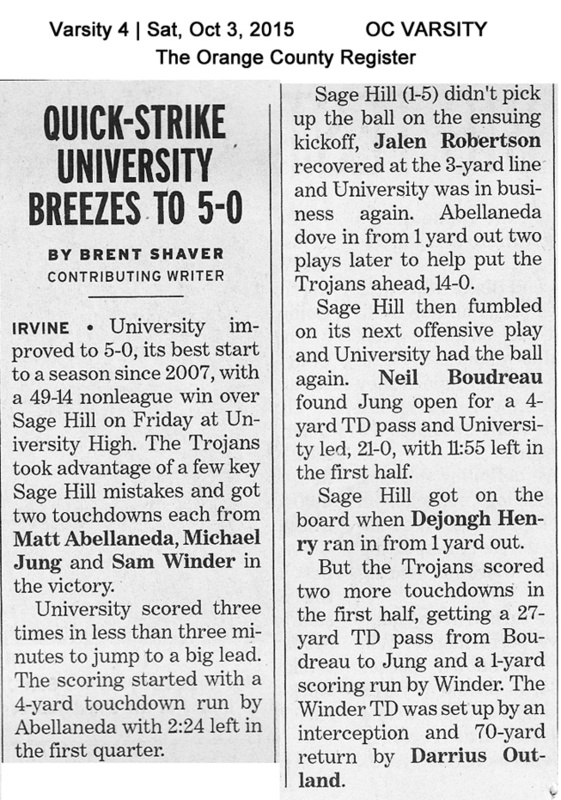 Below are articles from the OC Register and Irvine World News on our win v Sage Hill. Girls Golf – Our girls beat Northwood Tuesday with a team record low 178. This score broke the UNI school record. This score came from excellent scoring by every player. Samantha Cabunag (soph) scored a three under par 33 to lead all scorers. Ellen Takada (Sr) and Nodoka Honda (Fr) contributed 35 (one under par). Dana Choi shot an even par 36. What an amazing performance by our girls. Last Thursday we lost to Beckman by 4 strokes. This was the second time this season we fell to Beckman in a really close match. The final was 194-190. Samantha Cabunag lead all scores with a 38. Our girls are back on the course this afternoon as they battle CDM. Hit them straight girls. Girls Volleyball – UNI Volleyball started league play last Thursday with an away match against a talented Beckman team. We came out very strong in the first set and surprised Beckman and took the first set 27-25. Unfortunately Beckman came out stronger and won the next three sets but we again had an outstanding performance in the third set when after being down 13-20, we fought back to tie the score at 22 all before Beckman won the set 25-22. Our serving was a big highlight of the match as we served 18 aces with only missed 8 serves! That’s a very impressive serving match. Klaire Thoman and Kira Cashman led the serving effort with 6 and 5 aces respectively. Kira Cashman led the Uni offense with 11 kills and Alma Entesari hit for a very impressive .667 hitting percentage with 4 kills and no errors on 6 attempts. Madison Daniels directed the offense with 27 assists and Klaire Thoman led the backcourt defense with 23 digs. Alma Entesari had 3 blocks to lead the defensive effort at the net. Yesterday we took on Northwood at their place and despite some great rallies and outstanding plays we dropped the match in 3 sets. Kira Cashman and Kandyce Burn led the offense with 7 kills apiece with Alma Entesari adding 6 kills with no errors on 9 attempts for another outstanding .667 hitting percentage. Maddy Daniels played a great match with 24 assists, 14 digs, and 2 aces. Klaire Thoman had another outstanding defensive match leading the team with 23 digs again but this time in just 3 sets and Camryn Keyes added 5 blocks to slow down Northwood’s hitters. We look forward to taking on CDM at home today at 5:15 and hope to have another great crowd in the gym cheering us on! Good Luck Volleyball! Girls Tennis – The girls tennis team is currently 8 and 2 overall and 4 and 1 in the Pacific Coast League. Last Thursday the girls saw their streak of 54 straight league matches dating back to 2009 come to an end with a 4-14 loss to CdM. Anja Seng and Kayla Agustin won two of three sets playing 2nd doubles. Congratulations to all the girls over the 6 years who played some role in such an incredible streak. On Tuesday the girls rebounded with an impressive 18 to 0 win over Irvine. The Trojans will be back in action today with a home match against Woodbridge. Congrats on such an impressive streak. Good Luck today Tennis! Boys Water Polo – Boys Water Polo is currently 0-2 in Pacific Coast League action. A 13-4 loss at Beckman on 10/1 and an tough match that went down to the wire at Northwood on 10/6. Northwood will bring the Trojans home this Thursday 10/8 as they host Corona del Mar @ our own UNI pool with a 4pm varsity game start. Next week the team travels to Irvine H.S. on 10/13 then hosts Woodbridge at home on 10/15. Hope to see some of you there! Congratulations to Jacob Ghahremani who was selected as the OC Register scholar athlete of the week. Below is the article that was in the Register. Keep up the good work Jacob. Ghahremani enters the week with 51 goals. He has been on University’s varsity water polo team for two years and was selected Most Inspirational last year. He is the team captain this season. He was also a member of the University swim team that won a CIF-SS title last year. He is enrolled in AP biology, AP chemistry, AP literature, AP political science/economics and Associated Student Body. Ghahremani is vice-president of the Ping Pong Club and ASB liasion for guest speakers, and he is involved with the International Water Polo Club. Ghahremani hopes to play water polo at the NCAA level. He also wants to major in neuroscience and go to medical school to become a neurosurgeon. He is interested in Harvard, USC, UC San Diego, Michigan, Rice and Notre Dame. Girls Basketball – Calling all former varsity basketball players. We are having an alumni girls basketball game on Nov 27th at 6pm and would like to get as many alumni out as possible. Please pass this note on to anyone you may know that played girls basketball here at UNI. If you are an alum and interested in playing in the game please contact Coach Bradshaw at NicoleBradshaw@iusd.org. Student section of the week – TROJAN ARMY STRONG – Our Trojan Army student section was named student section of the week by OC Sidelines. The website came out and interviewed a few of our Trojan Army leaders this week and they will be publishing a story about how spirited our student section is. Great job UNI Students. 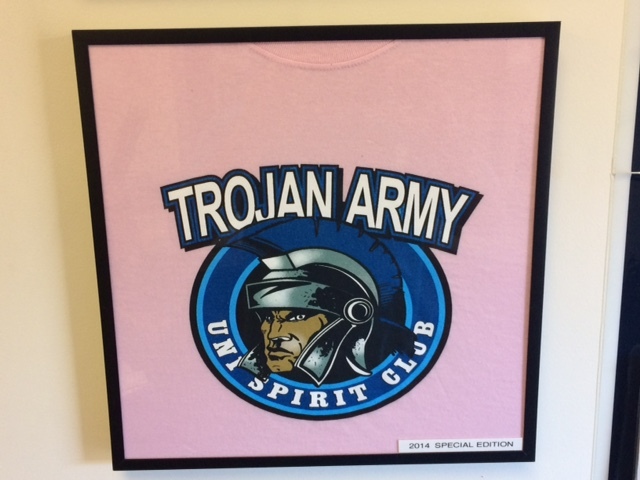 Pink Trojan Army Shirts – Our Pink out game is set for October 23rd v CDM. We started selling our Pink shirts at our football game last Friday and the sales were outstanding. We are currently selling what is left of our Pink Army shirts in the athletic office. The shirts are $8. Make sure to get your shirt before we sell out. Boys and Girls Cross Country– GOW 10/6 – Another hot day at the races. 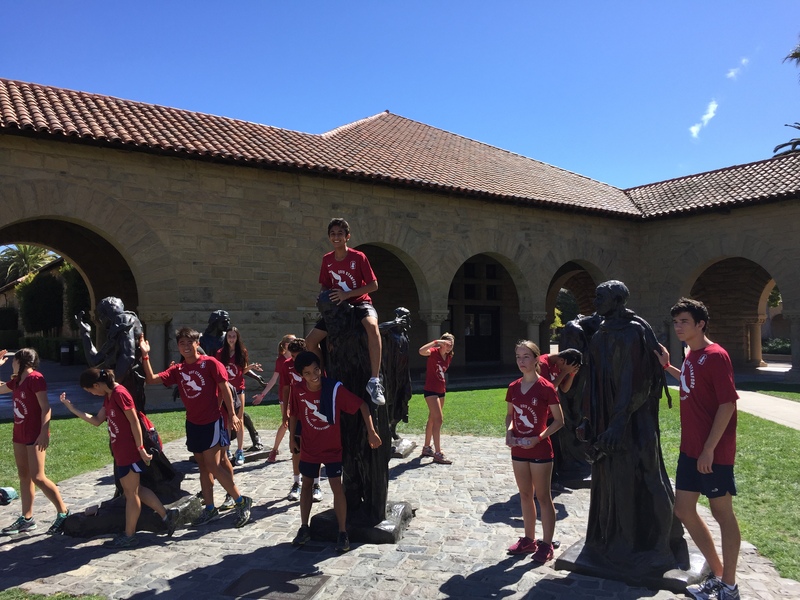 Our varsity group traveled and participated in the Stanford Cross Country Invitational over the weekend. Our top girl finishers were Junior Janine Bryant followed by Freshman Sara Sussman and Abby Sanders and for the boys our top finisher was senior Eric Kawana followed by senior Eli Tita and Senior Mackhai Nguyen. Our next meet will be our league cluster meet at Mason Park next Wednesday. This meet is the cross country Game of the week. Below is a picture of our runners posing at the Stanford invitational. 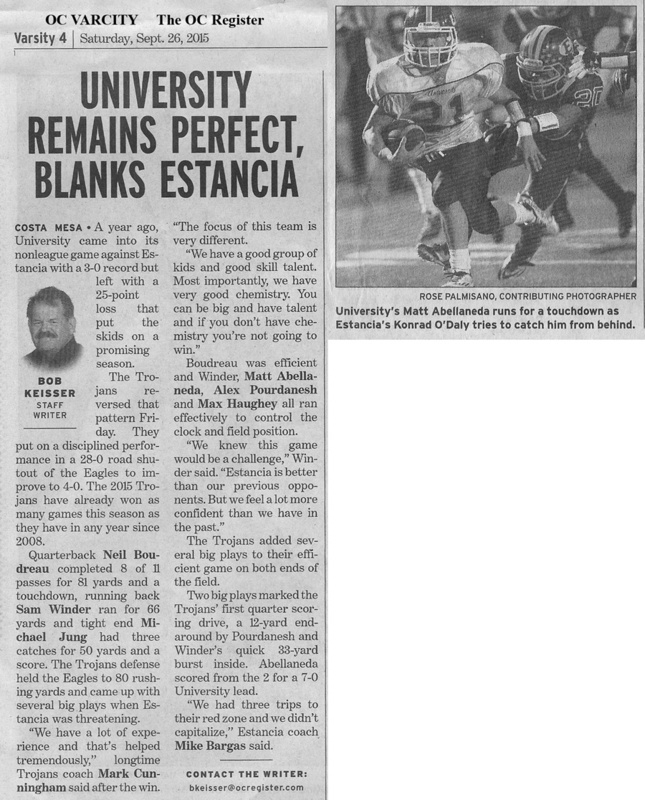 Football – Our UNI Defense played inspired football last Friday night and posted an impressive shutout v Estancia. The final score of the game was 28-0. Matt Abellaneda opened up the scoring with a 2 yard TD run in the first quarter. He followed that with an 18 yard run in the second quarter and our boys took a 14-0 lead to halftime. In the third neil Boudreau found Michael Jung for a 31 yard strike for a touchdown. Max Haughey capped the scoring in the 4th quarter. Tomorrow night is Homecoming v Sage Hill. Come out to the game and support our Trojans. Game time is 7:00. Below are a few articles that were in the papers about our boys. 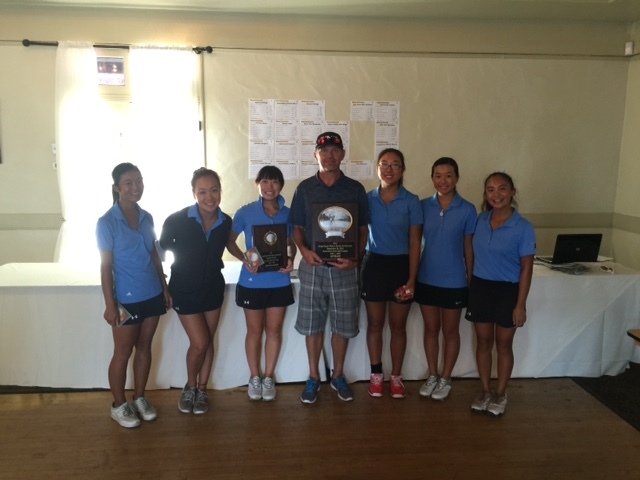 The UNI girl’s golf team brought home first place in the Long Beach Wilson tournament today. It was quite an accomplishment because there some high quality teams entered. We also had the overall individual champion in Ellen Takada, who shot a 68 (which is 4 under par for the golf course we played). Below is an article that was posted in the OC Register on Ellen and our girls. Great job girls. Our girls have their GOW next Tuesday @ Strawberry Farms v Northwood. Good Luck Golfers! LONG BEACH – The University girls golf team had high expectations this season. 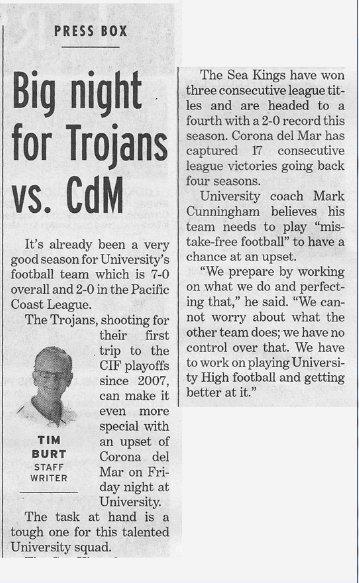 But after losing to Pacific Coast League rivals Beckman and Corona del Mar, the Trojans confidence was shaken. Backed by a 6-under-par 68 from Ellen Takada and an even-par 74 from Samantha Cabunag, University posted a 300 at Recreation Park Golf Course on Monday to edge Palm Desert by four strokes and win the Long Beach Wilson Bruins Invitational. Troy finished third with 316 while Mater Dei (321) and Santa Margarita (326) rounded out top five of the tournament, which counted the lowest four scores from each team. Takada finished with one eagle and six birdies to become the only player in the tournament to break 70 and win medalist honors by three strokes. Takada hit 16 fairways and 15 greens in regulation and needed 28 putts to finish her round. She also won the closest-to-the-pin award, landing 11 inches away from the hole on No. 7. Mater Dei freshman Khameryn Utu and Palm Desert’s Jiyoon Jang each carded a 3-under 71, but Utu was awarded second place on a card-off. Troy junior Beth Lillie finished fourth after winning a card-off with Palm Desert’s Kiki Liu. Both players posted a 72. Earlier this month, the Trojans lost to Beckman by four strokes and Corona del Mar by nine, two results that could have eliminated the Trojans from contention for the Pacific Coast League championship. “I sometimes hit bad shots, but I can still come back (when playing 18) and make birdies,” Takada said. Nodoka Honda also broke 80 on Monday for the Trojans, shooting a 76 at Rec Park. She won the long-drive award, too, smashing her tee shot 270 yards down the fairway on No. 17. “I really believe that we can go to CIF and do well,” Takada said. Below is a picture of our girls with their tournament championship trophies. Girls Volleyball – The last week has provided a lot of opportunities for learning and growing for UNI Girls Volleyball. Due to our senior setter Maddy Daniels being out for a few days we used some new lineups and offensive systems that gave many of our athletes chances to step up and contribute in our matches. On Thursday we took on El Modena at home and swept them in three sets with scores of 25-17, 25-18, and 25-16. Leylee Sahrai, Gelina Linsangan and Sherin Sayrani shared the setting duties while Kira Cashman led the offense with 12 kills, Ashley Kim led us at the service line with 4 aces, and Klaire Thoman anchored the defense with 23 digs. On Friday and Saturday we competed in our always competitive home tournament. While we didn’t come out on top on the scoreboard we learned a lot and had some great performances throughout the tournament. Kira Cashman again led the offense with 32 kills over the weekend while Leylee Sahrai directed the offense for the majority of the tournament with 67 assists. Klaire Thoman led the defense and at the service line with 48 digs and 7 aces. Camryn Keyes had 6 blocks on the weekend as well. We look forward to starting our competitive league schedule which provides us with more opportunities to get better against quality opponents. Our girls open up league play this afternoon at Beckman. Good Luck Volleyball! Girls Tennis – The girl’s tennis team continues to find ways to win. With five new girls in the starting line-up the team improved to 7 and 1 overall and 2 and 0 in the Pacific Coast league. The girls won a close match with league rival Northwood 10 to 8 on Tuesday. Michelle Maddox and Ashlyn Wang swept at first doubles and Anja Seng and Kayla Agustin swept at 2nd doubles. Freshmen Dana Feng finished the match with a grueling one hour long win at third singles. Our girls have a big showdown with CDM this afternoon at the UNI courts. The girls have won 54 straight PCL matches with the last league loss coming in 2009!!! Great job Tennis. It was a difficult last 7 days for the team as they lost 4 of 6 games. On Tuesday Sept. 29th the boys got shut out 3-0 in the 4th quarter to Fountain Valley as they fell on the road 11-7. At the previous weekend during the South Coast Tournament, the team notched convincing victories against Long Beach Poly (14-5) and Tesoro (16-9) while losing to Loyola of LA (23-3), Dos Pueblos of Santa Barbara (17-13) & Riverside Poly (15-10). Some top division college coaches were in attendance scouting and had some serious interest in a few of our athletes. With only the 10 league games remaining on the season, the Trojans will hope to find their edge and compete for a CIF playoff berth while pushing for a winning record as well. Jacob Ghahremani(Sr.) is still top 10 in Orange County and #1 in PCL in goals scored while Daniel Campanaro (Jr.) is narrowly trailing. UNI will travel to Northwood on Oct. 6th and hosts CDM on Oct. 8th. Good Luck in League Boys Polo! We have had spirit week activities all week here on campus. Yesterday morning we had a Trojan Spirit Walk and everyone was full of energy. We have had lunchfests each day this week with our class councils competing in fun events for spirit points. Spirit Night – Tonight is SPIRIT NIGHT. If you have never witnessed a UNI spirit night I strongly encourage you to bring the family and come check out this truly unique event. Each class council is given a building on campus and they decorate it according to their homecoming theme. Our kids have been preparing all summer and school year for tonight. Spirit night goes until 9:00 tonight. We will also have clubs out selling food. Bring the family and stop by UNI tonight and check out how amazing our UNI students are. Homecoming Assembly – Tomorrow we will have our homecoming pep rally. The school spirit is at an all-time high and the assembly is a way to showcase this spirit and get everyone excited for the game tomorrow night. TROJAN ARMY DAY – Tomorrow is another Trojan Army day on campus. Please remind your student to wear their Trojan Army shirt to school tomorrow and then to the game tomorrow night. Trojan Army Shirts – We received our latest shipment of Trojan Army shirts. They are the new Dry Fit shirts. We will not be placing another order this year. If you have been waiting for the Dry Fit shirts come to the athletic office and claim yours before they are sold out. Pink Trojan Army Shirts – Our Pink out game is set for October 23rd v CDM. We will be selling our Pink Trojan Army shirts at the game tomorrow night for $8. Last year we sold out of 400 shirts in just 30 minutes. If you don’t have a pink Army shirt your first chance to get it will be tomorrow night at the game.